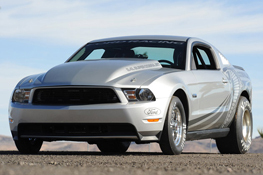 When Ford built a 50-unit run of the 2008 Mustang Cobra Jet last year, the program was a huge success with all the cars selling out well before production started. With the factory-built drag racing cars easily proving their worth at the nation's 1/4 mile tracks this year, doing a follow-up was a no brainer. After teasing the new car with testing photos and videos for the last several months, the 2010 FR500CJ is having its coming out party in Las Vegas for the 2009 SEMA Show. We managed to grab some photos of the 2010 Cobra Jet on the show floor just ahead of its official live debut tomorrow, so check out both the official and live photos below or read on to learn about the updates for the new model.